It’s not a North Face or even an L.L. Bean. Just an inexpensive Faded Glory fleece jacket from Wal-Mart. But it used to be Daddy’s jacket, and when he passed away last December, I took it for my own. Daddy never went anywhere, but his jacket kept me warm in A laska. 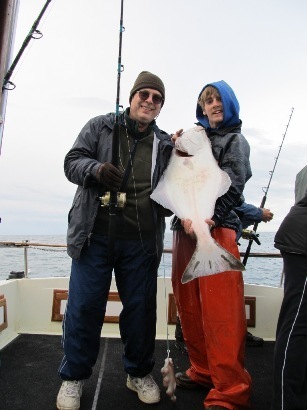 He never went fishing, but wearing his fleece, I caught my limit in halibut on Cook Inlet outside of Hom er, and the jacket stunk like the ocean, bait, and fish. 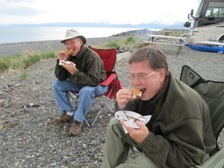 And later that day, after th e fish had been processed, and we were resting, I sat outside the RV in Daddy’s jacket and ate gooey s’mores. Daddy would have liked that. He never tasted s’mores, but he had a huge sweet tooth. Daddy’s jacket was zipped up on the deck of the glacier cruise ship, my shield against the wind, under my rain jacket . 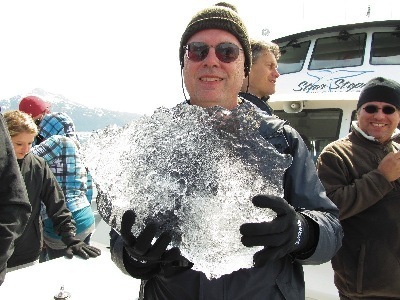 It kept me cozy along with some new Alaska gloves when I held a piece of an iceberg in my hands. As far as I know, Daddy was never on a boat of any sort. Daddy’s jacket got ashes on it from the campfire when we dry camped along the Denali Highway, with an incredibly beautiful valley vista for our backyard. It kept off the wind at the end of the line on the shuttlebus ride into Denali National Park, with Mt. McKinley in our view as we ate a simple lunch. What would Daddy have thought of such sights or the wildlife we encountered along the way? I went to Alaska in Daddy’s jacket. My niece Page is in China for two months. We’re doing things Daddy never even imagined or perhaps never wanted to do. But I thought of him every time I donned that green fleece. And Page is going beyond anything any of us in the family ever aspired to. Each generation builds on the foundation of the one before. And, if we are wise, if we are the sorts of people we ought to be, we do so with gratitude. Like for a simple jacket that went from Albany, GA to Starkville, MS and eventually to Alaska. © 2011 Tom Cheatham. Photos by Susan Cheatham.